Although I don't fancy a long list of resolutions which are unlikely to be kept, nonetheless, it feels good to re-focus and think about what is really important. For that reason maybe, there is a decorated mantel for New Year's celebration. 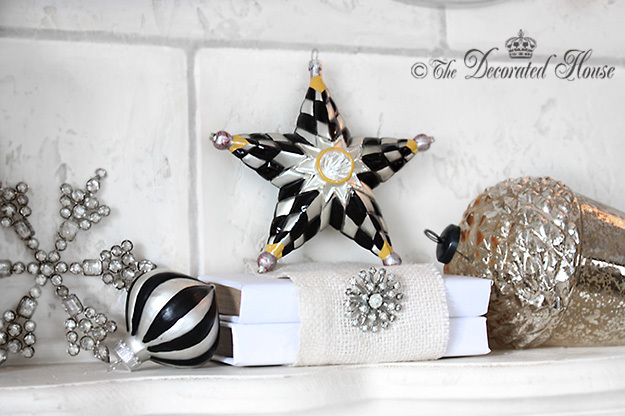 Because I love Mercury glass so much, it is a part of the decor, along with the pretty MacKenzie Childs' star. Black & white with sliver is perfect for New Years or just about anytime. In the midst of all the mess of packing up the Christmas decorations, I took some extra time to actually organize all of the decorations better. Each year, I think I'm doing that, and maybe next year it will still need more organizing, but for now it feels like something got done. 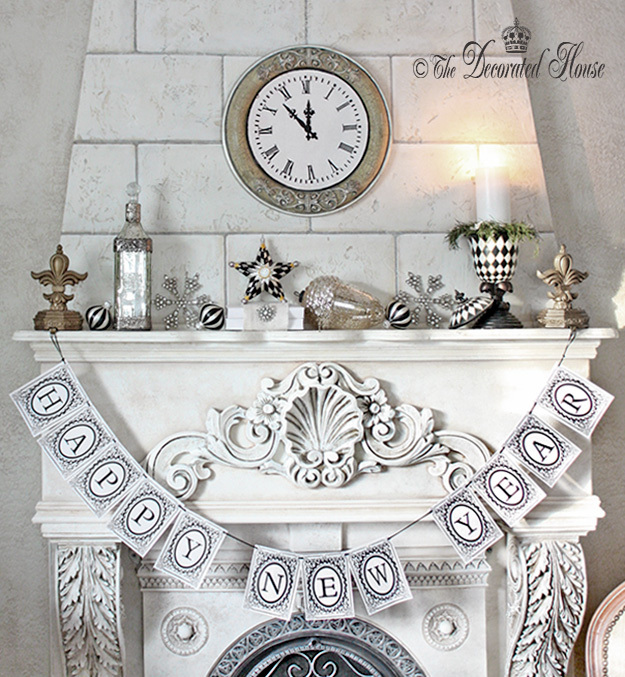 When everything was carefully packed away, I made a whimsical little garland saying Happy New Year simply printed on white paper and strung with black ribbon. 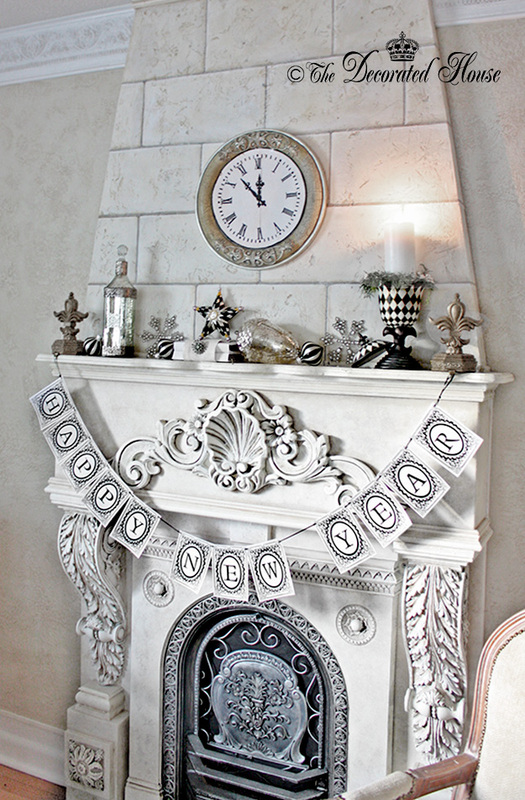 Happy New Year Garland - Banner Made from White Paper & Black Ribbon, Letter Designs by me, printed on my printer, cut, holes in the top corners, strung on the ribbon. always gorgeous, Donna, Happy Happy New Year!! Всего - всего самого желанного!!! I love black, don't you? And MacKenzie Childs is always perfect. Your mantel looks beautiful, Donna! I love the black and white pieces mixed in with the mercury glass. It's perfect for welcoming in the new year! and all of your wishes. Let every day of the New Year be the best ever. The Best to You, too Helena. Diana, Debra, Laura, Kathy, thank your for stopping by. This New Year's Eve mantle is exquisite!!! I adore the black and mercury silver combinations!!! Have a Happy New Year filled with health & prosperity, dear friend!!! I look forward to following you in 2013! Happy New Year! You are so talented and thank you for sharing. Gorgeous mantle! Happy New Year! Too darn cute Ayfer! Makes me want to sing and play in snow. Donna that's a beautiful mantel! 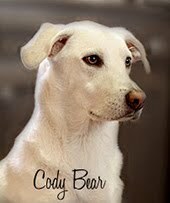 I love the Mackenzie Childs star and the banner you made! I love the garland, what a beautiful display, never thought about doing one for New Years!